Having sorted out my own shoes, it was time to tackle everyone else’s. Our hall was a riot of shoes all over the place. Everyone just came in and took them off which was great for the carpets but not so good from a clutter point of view. It also made the hall look smaller than it is. Having hidden them all when a neighbour came round, she remarked that the hall seemed bigger than usual! So the shoe problem really needed to be resolved. I had used a temporary solution as mentioned last week – putting all the shoes in two Really Useful boxes. This had helped but was obviously not a permanent solution. It is always good to start with something easy as it gives you a boost. My son is now at university and is renting a house for the next two years. He is very unlikely to live at home again so I found the few pairs of shoes he had left behind and put them in the bottom of his wardrobe. That still left another 18 or so pairs of shoes to find a home for. We have tried using the cupboard under the stairs before but it is too small and poky so family members tend not to bother replacing shoes once freed. No-one else in the family had room in their bedrooms for their shoes so I finally decided that we needed to buy some purpose built shoe storage. It turns out there are loads of options out there!. 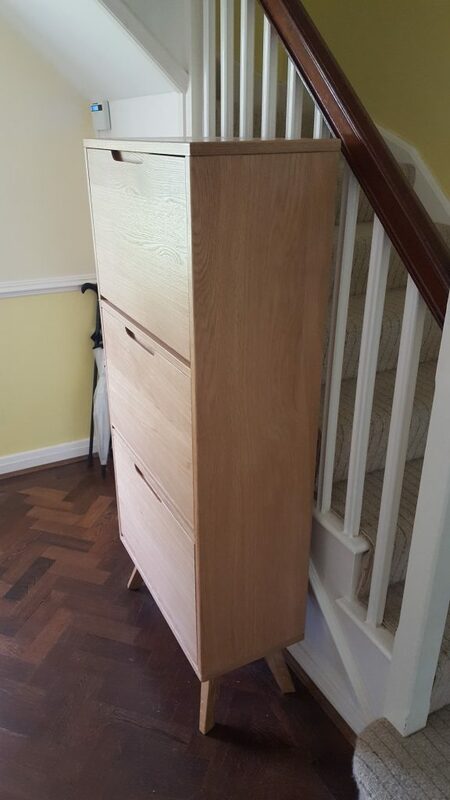 Having spent hours researching, I decided that shoe storage that looked like a cupboard or chest of drawers would be the best solution for our hall. I found that Made.com had a good looking and not too expensive shoe cupboard (we went for the Jenson style) and this is now installed. It is easy to use and everyone now puts their shoes away without being asked. Choose something that suits the style of your home. Count the number of shoes you need to store to make sure the solution is big enough. Make sure that your intended solution takes the size of your shoes. The largest shoe size in our family is a Men’s size 8, so not that big; you may need to check with the seller as to the maximum shoe size that will fit into their storage. Ensure the storage is easy to use and conveniently situated – or it will be ignored. A few years ago, we had a serious shoe storage problem. Between all 4 of us, we must own over 30 pairs of shoes. And most of them were in the hall. In desperation I had put about half of them in a couple of Really Useful Boxes (my favourite storage boxes) to be accessed as needed. Of course this did not look good and the shoes were not put back in again once used. 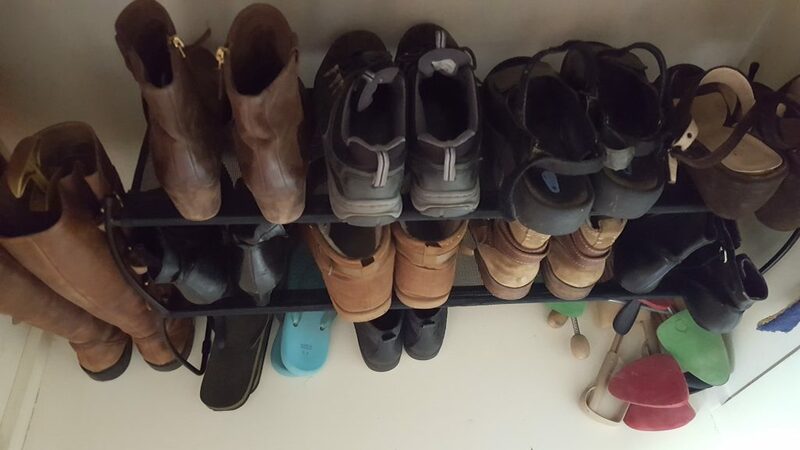 I researched shoe storage on the Internet and have found that there were loads of options available from cheap shoe racks to high tech wall hanging shoe cupboards. 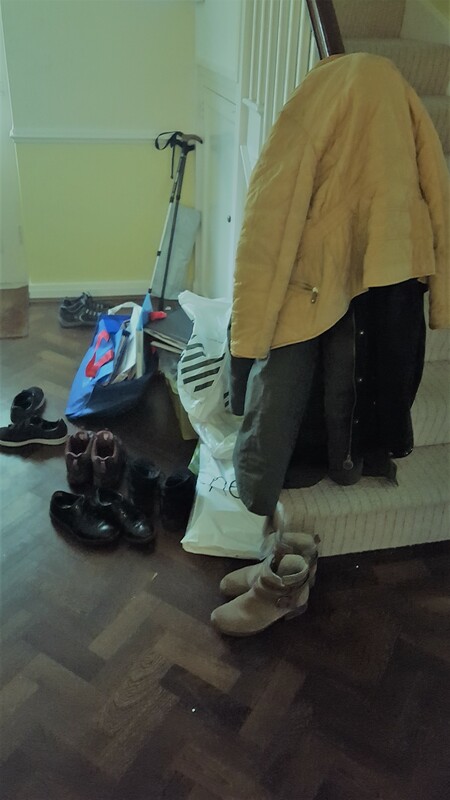 However finding something that was sturdy, not too expensive, fitted into our hall as well as with the overall look of the house and was able to store more than 10 pairs of shoes proved difficult. So I decided to regroup and tackle the problem one step at a time. It occurred to me that I was the only one of the family who had room in their wardrobe to store shoes. Therefore, if I could find a way of getting some of my shoes upstairs, there would at least be slightly less to deal with! Years ago, I invested in plastic shoe storage boxes that were all the rage in the heyday of shows like Changing Rooms. The only trouble was that I never did add polaroid photographs of the contents so finding a specific pair of shoes was always a bit of a chore and, as with my temporary storage solution above, I found that it was always more of an effort to put the shoes back than take them out. Not only that, but I found that shoes that were only worn during one season such as Summer sandals invariably had to have mould washed off them before use each year. We do have a damp problem with our wardrobes which I control successfully with hanging dehumidifiers but shoes need air. A few years ago, I decided to try use the original cardboard shoe boxes which worked better but was still not ideal. Paper attracts moisture so the shoes were ok but the boxes always felt dampish. Not nice. I had a big think and suddenly realised that a shoe rack in the bottom of the wardrobe would make much more sense. The shoes would be much less likely to go mouldy as they would not be enclosed, I would be able to easily spot which shoes I wanted and, very importantly for me, I would be able to easily put them back!!! I ordered a shoe rack from Amazon and my lovely son put it together for me. (I probably could have done it but he is really good at self-assembly!). I went to my wardrobe and took everything off the floor. It was a good opportunity to have a general clearout. First to go were the jumble of plastic boxes (mostly empty owing to a big shoe clearout about 18 months ago) and old cardboard shoe boxes. Then I decided to get rid of some posh sandals that I never wear, old clothes I kept for decorating but haven’t used for years and some books I purchased as gifts but then decided were unsuitable. Once everything was out, I cleaned the wardrobe floor and then put in my new shoe rack. It looks soooooo much better than the boxes. I wish I had taken a before and after photograph but never mind. Here is the shoe rack in all its glory. What I also like is that it is a simple solution which Is what I prefer – no polaroids, no stacking, just easy. Best of all, I was able to remove all my shoes from the hall so there were a few less pairs to store there. Next step was to tackle everyone else’s shoes!!! Once you have decluttered, you need to get rid of your stuff as quickly as you can. I always try and throw away as little as possible as so much is still usable. Clothing and other items can go to Charity shops or be sold on Ebay or a car boot sale. But what about other things that are more difficult to recycle but still useable like redundant juicers or furniture. For these kind of things, I tend to use Freegle. There are also Freecycle groups and others that do the same thing. Freecycle started in the US in 2003 and since then has spread throughout the world, including the UK. However in 2009, there was a falling out between the American organisation and those running groups in the UK. 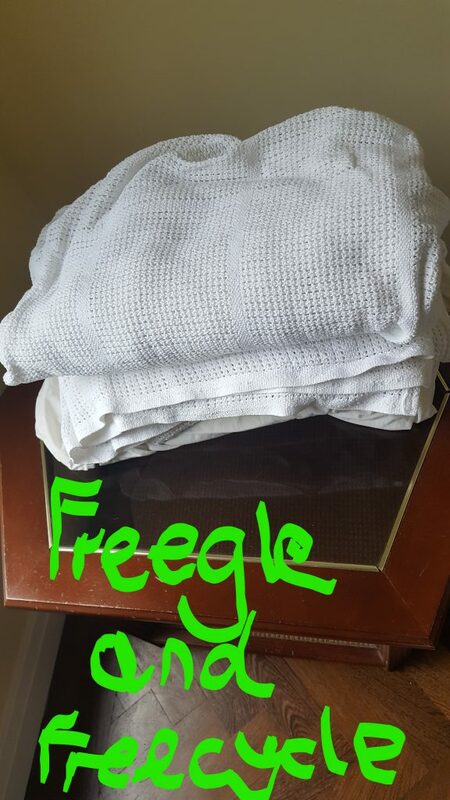 The result was that many of the UK Freecycle groups left and formed Freegle. To find a local group go to either the Freegle or Freecycle website; they both have location finders. Essentially, Freegle and similar groups are an online noticeboard often run through Yahoo Groups where you can Offer whatever you have to the rest of the group. You can also post ‘Wanted’ notices if you think someone may have something you want. Once you have joined the Group you can start to post either by clicking on New Topic or by following the Message Maker link to the Freegle main site. In the Subject line, you start with either OFFER (things you want to get rid of), WANTED (things you hope someone will want to give to you) or TAKEN (for when the Offered item(s) have been collected and you want to stop people requesting them}. Then you add a short description eg ‘Tall bookcase’ or ‘Garden pot’, followed by usually the town or area you live in and the first part of your postcode. You can give a more detailed description in the body of the email and you can also upload photographs. I usually add a request to let me know when the item could be collected. At this point, do not add any personal details like your name and address. Once you have uploaded your post, it will be checked by a moderator and, if everything is ok, will then appear on the group page. You should start getting replies from people interested in the item fairly soon. I usually give it a day before deciding who to offer the item to. I try and go for people who tell me why they want it and when they can collect as I have found them to be the most reliable collectors. I have occasionally had people request an item and then not reply to my offer email but this is very much the exception. Once I have confirmed with the collector that they still want the item, we then arrange a day and time for collection. And it is only at that point that I give my address. Most people that have turned up have been polite and friendly and I have felt that my item was going to a good home. As soon as the item has been collected, you should post a TAKEN notice where you simply use the same info as in the Subject for the OFFER but precede it by TAKEN. In the body of the post, you just need to say that the item has been taken and thanks to all who replied. I used to email individually everyone who had replied but I just do the TAKEN post now. If you join up to several groups, it is worth looking at Trash Nothing which enables you to manage all your groups in one place online with only replies to your postings being sent to your normal email address. Freegle and similar groups are a great way of recycling items that still have life in them but that charity shops won’t take. It’s minimal effort and items are collected from you which is brilliant. Saving the planet couldn’t be easier!